For this month's "Maps Of The Month" featurette, I wish to draw your attention to FlyingArmor's Lufia & The Fortress Of Doom (Super NES) maps. A large castle, atop an ominous floating island, housing evil deities who call themselves the Sinistrals, well deserves the moniker of "Fortress Of Doom". The Sinistrals seek to conquer the world, and certainly the humans don't care for that. It's up to the hero, a descendent of the swordsman Maxim, to defeat the Sinistral army once again, as his predecessor had, ninety-nine years earlier. I'm sure I sound like a broken record when I rave about fully labelled RPG maps. But why shouldn't I? RPGs tend to be long games with many areas; here there are over 80 maps by FlyingArmor, all fully labelled. Sure, there's the usual labeling of the contents of treasure chests - the dungeons of this game seem to have a higher-than-average number of them - but there are also many hidden items not in chests in non-dungeon areas, which you can locate with these maps. Not only are the treasures numerous, but the floors and doors and stairs too. I always say it's handy to have a guide when playing RPGs thoroughly, but this is one of those games where I really mean it. If you never get lost here, especially in those towers, you can thank FlyingArmor, who's no stranger to the cartography of RPGs. 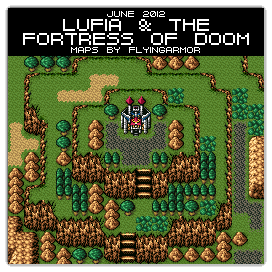 So to recognize the effort put into saving us from doom, FlyingArmor's Lufia & The Fortress Of Doom (Super NES) maps will be known as VGMaps.com's Maps Of The Month for June 2012. It sure was a pleasant surprise to see this while unwinding after Anime North last week. Thanks very much! This sort of makes me want to do charts for finding the Dragon Eggs the second and third times around. I had planned on doing that before, but never got around to it. It would certainly make the map set that much more complete. Very nice maps here. I never used the maps when playing the game a long time ago. Didn't even have Internet then. The style is good as well using the font and the window scheme of the actual game. That's always nice. There is plenty to miss in this game if you had no map labels. Congrats FlyingArmor! You did well grasshopper!